Festivities on the Southwestern Adventist University campus in Keene marked the University’s 125th birthday on Thursday, Jan. 10, with a myriad of fun activities and food directed at friends, faculty and students of Southwestern Adventist University. “We want to welcome you to a special day, our birthday.” President Ken Shaw said as he opened the special assembly. His words set the tone for the entire day’s activities. The birthday celebration actually started the afternoon before with an interactive, campus-wide scavenger hunt that gave student participants the opportunity to win prizes, which were awarded during the weekly student assembly on Thursday afternoon. Perhaps the highlight of the day came when a panel of current and former staff and alumni consisting of Bob Mendenhall, Bev Mendenhall, Bugger Putnam, Dale Hainey and Kisha Norris answered questions from Amy Rosenthal, Southwestern Adventist University’s VP for Academic Administration. Antique images, displayed on the screen, included Keene’s old broom factory, old bands, the University’s former indoor swimming pool, a time when Leiske-Pultar Gymnasium didn’t have walls, the Cowabunga Skiiers, the Pioneer Memorial Tile Mural, and the fountain outside Findley Hall. Centennial cupcakes and guest panelists were featured during a special pop-up reception in the afternoon at the Chan Shun Centennial Library. 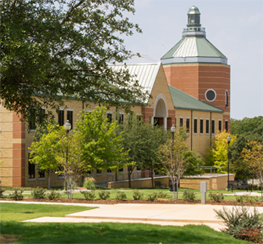 The library was dedicated 25 years ago during the University’s Centennial Founder’s Day. Additional giveaways and refreshments were available in the afternoon at the new Larry R. Moore Nursing and Administration Building, and an interactive timeline was exhibited at Chan Shun Centennial Library. Cristina Thomsen, library director for the Chan Shun Centennial Library, states that she came to Keene from Colorado in 1963 “as a little kid.” Her father, Eugene Thomsen, was hired to teach languages, including Spanish, German and occasionally Biblical languages. Thomsen considers Founder’s Day a “wonderful idea.” “It’s always great to stop and remember how we’ve gotten to this point. I thought it was so great that students were gazing at the maps on the screens in assembly, wondering where things were.